Tropical Paradise has been a popular romantic getaway since 2003. This beautifully decorated home with private beach and large floating dock is surrounded by thick, lush, tropical foliage including banana, papaya, palm trees, and many tropical flowers. The master bedroom overlooks the dipping pool and ocean. There are 2 king beds, 2 single beds and 1 queen futon. The screened-in porch encloses with vinyl sliding windows. Kayaks and bikes are provided. There are several local restaurants within 1-8 miles of the property. Bahia Honda State Park Beach is about 8 miles away. 20 Miles to Key West and all it has to offer. . You can swim and fish off of the dock. we recommend always wearing water shoes when swimming in the ocean. I've lived in the Keys for 27 years and love to help my guests create the best vacation experience ever. The Lower Florida Keys has peace and quiet, nature, tropical living, Bahia Honda State park and Key West. The Tropical Paradise has lush tropical landscape including papayas, bananas, coconuts and other fruits and tropical flowers. The ocean view is one of the best. When you wake up in the Master Bed you are so close to the ocean you feel like you are on a boat. Une jolie maison dans un environnement unique, face à la mer avec une vue magnifique. Très bien équipé le logement est dans un endroit calme. Nous avons utilisé les vélos et les kayaks sur place avec bonheur. Nous avons eu du mal a quitter ce lieu paradisiaque. Nous espérons pouvoir y séjourner à nouveau. Very clean, private, well equipped. We enjoyed our 5 days at this private, quiet home. There are steps and 2 of our party are handicapped but we made it work. Loved the screened porch, open deck and private dock. Lizards everywhere. Wonderful home in a pristine setting! My wife and I rented Tropical Paradise and it was absolutely perfect for our needs and desires. The privacy of the deck, pool, and small sandy area overlooking the ocean was just what she wanted. The available kayaks, bikes, abundant wildlife and peace and quiet was all I wanted. The house itself is sparkling clean and well appointed. 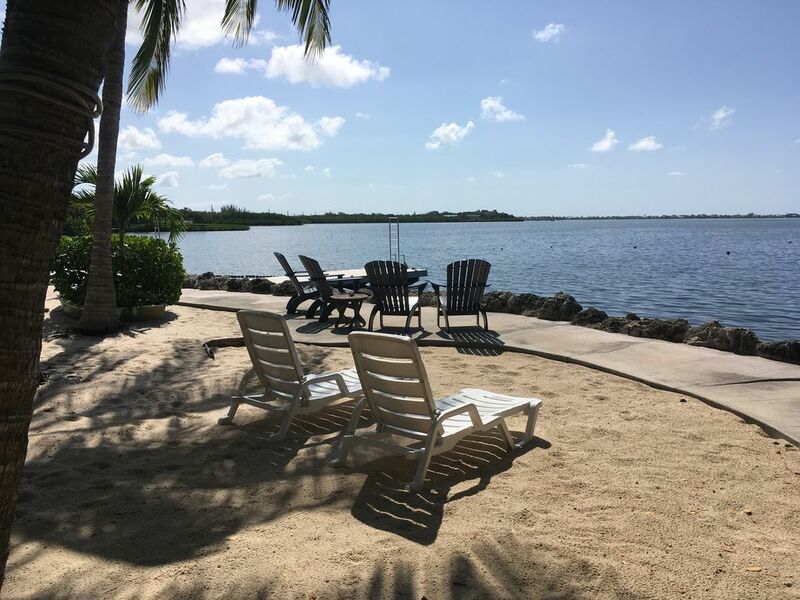 It is the perfect place for one or two couples to enjoy the beauty of Cudjoe Key. We will certainly return! This was our family vacation- my husband & I along with our teenager. We weren't interested in staying someplace crowded, busy or noisy. We wanted the laid back experience while being close to things to do. THE HOME- This place was CLEAN! I am very particular and let me tell you the place was immaculate! The only thing I felt compelled to clean was the remote control for the TV. Cleanest vacation spot we have ever been in and I am eternally grateful for that! Plenty of space for us. Kitchen was fine for cooking and fully stocked (which I did most nights). Living room had two couches. We brought our Roku with us so we could watch our shows. Internet was great and fast. My kid was in the front bedroom and used the bath across the hall while we stayed in the room overlooking the pool and water. Quiet, peaceful and perfect. THE EXPERIENCE- We spent our time in the water. We snorkeled along the rock wall by the dock (lots of fish there) and kayaking. The bay is pretty shallow and we even kayaked over to Gopher Key one morning! We never got around to the bicycles but they were there for our use. The dipping pool was great for just lounging and staying cool. We did not use the hot tub (not interested). We used their hammock and brought one of our own so the whole family could hammock together! We would get up early and pick the mangoes off the ground that had fallen- best I have ever tasted. We also did iguana watching as they love sunning themselves on the rock wall! It was a 20 minute or so drive to Key West which we did several times for activities and restaurants. In Cudjoe Key we ate at the Square Grouper (highly recommend). We shopped at the Publix in Key West (never went to the Winn Dixie nearby). I would not hesitate to return (and hope to) or recommend this highly to anyone looking for a piece of paradise in the Keys! 21 miles from Key West, 15 miles from Bahia Honda State Park which has beautiful beaches. Kayaks come with rental. At least one person in your party must be a minimum of 30 years old. We are pet friendly. There are certain breeds of dogs that our insurance company does not allow. Please check with us before booking if you plan to bring your pet. There may be additional fees if you are bringing more than one pet.